Article 4 of Regulation (EC) No 551/2004 requires the Commission to adopt implementing rules on rules of the air and on the uniform application of airspace classification. The Union's rules of the air have been developed in two phases. In Phase I (SERA Part A), the Commission, supported by Eurocontrol, the European Aviation Safety Agency (‘Agency’) and the International Civil Aviation Organisation (‘ICAO’), prepared the transposition into Union law of Annex 2 to the Convention on International Civil Aviation (‘Chicago Convention’). In Phase II (SERA Part B), the relevant provisions from Annexes 3 and 11 to the Chicago Convention have been transposed into Union law. The outcome was Commission Implementing Regulation (EU) No 923/2012 (3), combining both those Parts A and B in one Union act. Implementing Regulation (EU) No 923/2012 should now be completed by including in it the remaining relevant ICAO provisions, in particular those set out in Annex 10 to the Chicago Convention and in Document 4444 (PANS-ATM), which have a rules of the air-nature and which have not yet been transposed into Union law. Implementing Regulation (EU) No 923/2012 should also be aligned with Commission Regulations (EU) No 965/2012 (4) and (EU) No 139/2014 (5), in order to ensure a consistent approach to regulating civil aviation safety. For the same reason, and in order to ensure a more user-friendly presentation of the applicable rules, the rules set out in Commission Regulation (EC) No 730/2006 (6) should be inserted in Implementing Regulation (EU) No 923/2012. Therefore, Implementing Regulation (EU) No 923/2012 should be amended accordingly and Regulation (EC) No 730/2006 should be repealed. Sufficient transition time should be provided for Member States, aircraft operators, air navigation service providers and other interested parties to be able to correctly implement this Regulation, including the necessary publication of new procedures and the training of operators and affected staff. However, the provisions of this Regulation containing urgent amendments of Implementing Regulation (EU) No 923/2012 in light of recent amendments of Annexes 2 and 11 to the Chicago Convention or lessons learned from the implementation of Regulation (EU) No 923/2012 should apply already from an appropriate earlier date, taking into account the system of aeronautical information regulation and control ‘AIRAC’ notification dates. The measures provided for in this Regulation are based on the opinion issued by the Agency in accordance with Articles 17(2)(b) and 19(1) of Regulation (EC) No 216/2008. ‘4. This Regulation shall not apply to model aircraft and toy aircraft. However, Member States shall ensure that national rules are established to ensure that model aircraft and toy aircraft are operated in such a manner as to minimise hazards related to civil aviation safety, to persons, property or other aircraft.’. non-precision approach (NPA) procedure. An instrument approach procedure designed for 2D instrument approach operations Type A.
approach procedure with vertical guidance (APV). A performance-based navigation (PBN) instrument approach procedure designed for 3D instrument approach operations Type A. “toy aircraft” means an unmanned aircraft designed or intended for use, whether or not exclusively, in play by children under 14 years of age;’. ‘This Article shall also be without prejudice to helicopter operating minima contained in the specific approvals granted by the competent authority, pursuant to Annex V to Commission Regulation (EU) No 965/2012 (*). (*) Commission Regulation (EU) No 965/2012 of 5 October 2012 laying down technical requirements and administrative procedures related to air operations pursuant to Regulation (EC) No 216/2008 of the European Parliament and of the Council (OJ L 296, 25.10.2012, p. 1).’;"
The Annex is amended in accordance with the Annex to this Regulation. Regulation (EC) No 730/2006 is repealed. It shall apply from 12 October 2017.
points (1), (2), (3), (4), (5), (6), (8) (12), (13), (15), (16), (19), (21), (22), (26)(b), (26)(c), (27) and (28) of the Annex. Done at Brussels, 20 July 2016. (1) OJ L 96, 31.3.2004, p. 20. (2) OJ L 79, 19.3.2008, p. 1. (3) Commission Implementing Regulation (EU) No 923/2012 of 26 September 2012 laying down the common rules of the air and operational provisions regarding services and procedures in air navigation and amending Implementing Regulation (EU) No 1035/2011 and Regulations (EC) No 1265/2007, (EC) No 1794/2006, (EC) No 730/2006, (EC) No 1033/2006 and (EU) No 255/2010 (OJ L 281, 13.10.2012, p. 1). (4) Commission Regulation (EU) No 965/2012 of 5 October 2012 laying down technical requirements and administrative procedures related to air operations pursuant to Regulation (EC) No 216/2008 of the European Parliament and of the Council (OJ L 296, 25.10.2012, p. 1). (5) Commission Regulation (EU) No 139/2014 of 12 February 2014 laying down requirements and administrative procedures related to aerodromes pursuant to Regulation (EC) No 216/2008 of the European Parliament and of the Council (OJ L 44, 14.2.2014, p. 1). (6) Commission Regulation (EC) No 730/2006 of 11 May 2006 on airspace classification and access of flights operated under visual flight rules above flight level 195 (OJ L 128, 16.5.2006, p. 3). (7) Regulation (EC) No 549/2004 of the European Parliament and of the Council of 10 March 2004 laying down the framework for the creation of the single European sky (the framework Regulation) (OJ L 96, 31.3.2004, p. 1). bearing the nationality and registration marks of a Member State of the Union, and operating in any airspace to the extent that they do not conflict with the rules published by the State having jurisdiction over the territory overflown. Class A. IFR flights only are permitted. All flights are provided with air traffic control service and are separated from each other. Continuous air- ground voice communications are required for all flights. All flights shall be subject to ATC clearance. Class B. IFR and VFR flights are permitted. All flights are provided with air traffic control service and are separated from each other. Continuous air- ground voice communications are required for all flights. All flights shall be subject to ATC clearance. Class C. IFR and VFR flights are permitted. All flights are provided with air traffic control service and IFR flights are separated from other IFR flights and from VFR flights. VFR flights are separated from IFR flights and receive traffic information in respect of other VFR flights and traffic avoidance advice on request. Continuous air-ground voice communications are required for all flights. For VFR flights a speed limitation of 250 kts indicated airspeed (IAS) applies below 3 050 m (10 000 ft) AMSL, except where approved by the competent authority for aircraft types, which for technical or safety reasons, cannot maintain this speed. All flights shall be subject to ATC clearance. Class D. IFR and VFR flights are permitted and all flights are provided with air traffic control service. IFR flights are separated from other IFR flights, receive traffic information in respect of VFR flights and traffic avoidance advice on request. VFR flights receive traffic information in respect of all other flights and traffic avoidance advice on request. Continuous air-ground voice communications are required for all flights and a speed limitation of 250 kts IAS applies to all flights below 3 050 m (10 000 ft) AMSL, except where approved by the competent authority for aircraft types, which for technical or safety reasons, cannot maintain this speed. All flights shall be subject to ATC clearance. Class E. IFR and VFR flights are permitted. IFR flights are provided with air traffic control service and are separated from other IFR flights. All flights receive traffic information, as far as is practical. Continuous air-ground voice communications are required for IFR flights. A speed limitation of 250 kts IAS applies to all flights below 3 050 m (10 000 ft) AMSL, except where approved by the competent authority for aircraft types, which for technical or safety reasons cannot maintain this speed. All IFR flights shall be subject to ATC clearance. Class E shall not be used for control zones. Class F. IFR and VFR flights are permitted. All participating IFR flights receive an air traffic advisory service and all flights receive flight information service if requested. Continuous air-ground voice communications are required for IFR flights participating in the advisory service and all IFR flights shall be capable of establishing air-ground voice communications. A speed limitation of 250 kts IAS applies to all flights below 3 050 m (10 000 ft) AMSL, except where approved by the competent authority for aircraft types, which for technical or safety reasons cannot maintain this speed. ATC clearance is not required. Class G. IFR and VFR flights are permitted and receive flight information service if requested. All IFR flights shall be capable of establishing air- ground voice communications. A speed limitation of 250 kts IAS applies to all flights below 3 050 m (10 000 ft) AMSL, except where approved by the competent authority for aircraft types, which for technical or safety reasons cannot maintain this speed. ATC clearance is not required. Implementation of Class F shall be considered as a temporary measure until such time as it can be replaced by an alternative classification. Clearances shall be issued solely for expediting and separating air traffic and be based on known traffic conditions which affect safety in aircraft operation. Such traffic conditions include not only aircraft in the air and on the manoeuvring area over which control is being exercised, but also any vehicular traffic or other obstructions not permanently installed on the manoeuvring area in use. ATC units shall issue such ATC clearances as necessary to prevent collisions and to expedite and maintain an orderly flow of air traffic. When issuing a clearance covering a requested change in route or level, the exact nature of the change shall be included in the clearance. When traffic conditions will not permit clearance of a requested change, the word “UNABLE” shall be used. When warranted by circumstances, an alternative route or level shall be offered. For flights in areas where a transition altitude is established, the vertical position of the aircraft shall, except as provided for in (5) below, be expressed in terms of altitudes at or below the transition altitude and in terms of flight levels at or above the transition level. While passing through the transition layer, the vertical position shall be expressed in terms of flight levels when climbing and in terms of altitudes when descending. The flight crew shall be provided with the transition level in due time prior to reaching it during descent. A QNH altimeter setting shall be included in the descent clearance when first cleared at an altitude below the transition level, in approach clearances or clearances to enter the traffic circuit, and in taxi clearances for departing aircraft except when it is known that the aircraft has already received the information in a directed transmission. A QFE altimeter setting shall be provided to aircraft on request or on a regular basis in accordance with local arrangements. when advised that the ATS surveillance identification is lost. (*) These elements are replaced by the term ‘CAVOK’ when the following conditions occur simultaneously at the time of observation: (a) visibility: 10 km or more, and the lowest visibility not reported; (b) no cloud of operational significance; and (c) no weather of significance to aviation.’;"
(**) These elements are replaced by the term ‘CAVOK’ when the following conditions occur simultaneously at the time of observation: (a) visibility: 10 km or more, and the lowest visibility not reported; (b) no cloud of operational significance; and (c) no weather of significance to aviation.’;"
(***) These elements are replaced by the term ‘CAVOK’ when the following conditions occur simultaneously at the time of observation: (a) visibility: 10 km or more, and the lowest visibility not reported; (b) no cloud of operational significance; and (c) no weather of significance to aviation.’;"
Unless otherwise prescribed by the competent authority, aircraft equipped with suitable two-way radio-communications shall report during the period 20 to 40 minutes following the time of the last contact, whatever the purpose of such contact, merely to indicate that the flight is progressing according to plan, such report to comprise identification of the aircraft and the words “Operations normal”. In case of an aircraft known or believed to be in a state of emergency, including being subjected to unlawful interference, ATS units shall give the aircraft maximum consideration, assistance and priority over other aircraft, as may be necessitated by the circumstances. Subsequent ATC actions shall be based on the intentions of the pilot, the overall air traffic situation and the real-time dynamics of the contingency. 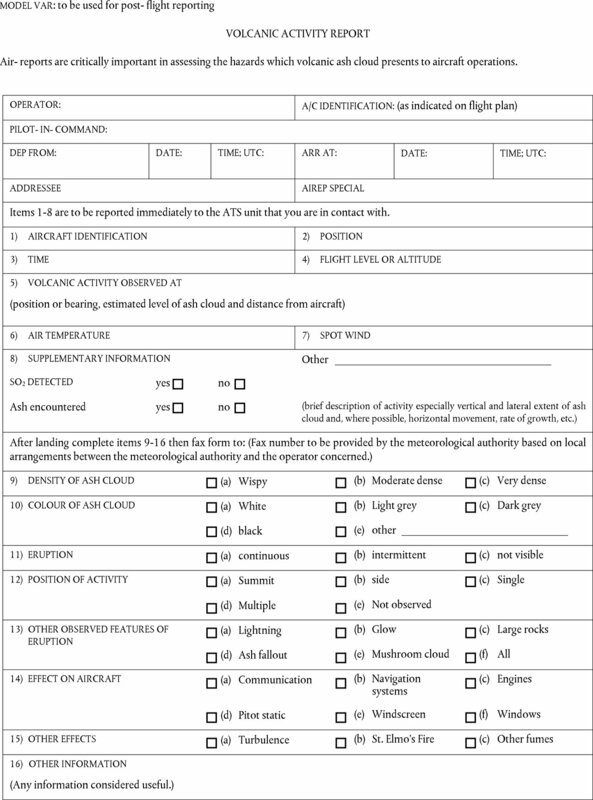 An aircraft which is being subjected to unlawful interference shall endeavour to set the transponder to Code 7500 and notify the appropriate ATS unit of any significant circumstances associated therewith and any deviation from the current flight plan necessitated by the circumstances, in order to enable the ATS unit to give priority to the aircraft and to minimise conflict with other aircraft. If an aircraft is subjected to unlawful interference, the pilot-in-command shall attempt to land as soon as practicable at the nearest suitable aerodrome or at a dedicated aerodrome assigned by the competent authority, unless considerations aboard the aircraft dictate otherwise. When an occurrence of unlawful interference with an aircraft takes place or is suspected, air traffic services units shall attend promptly to requests by the aircraft. Information pertinent to the safe conduct of the flight shall continue to be transmitted and necessary action shall be taken to expedite the conduct of all phases of the flight, especially the safe landing of the aircraft. When a pilot reports a state of minimum fuel, the controller shall inform the pilot as soon as practicable of any anticipated delays or that no delays are expected. When the level of fuel renders declaring a situation of distress necessary, the pilot, in accordance with SERA.14095, shall indicate that by using the radiotelephony distress signal (MAYDAY), preferably spoken three times, followed by the nature of the distress condition (FUEL). Whenever, as a result of failure or degradation of navigation, communications, altimetry, flight control or other systems, aircraft performance is degraded below the level required for the airspace in which it is operating, the flight crew shall advise the ATC unit concerned without delay. Where the failure or degradation affects the separation minimum currently being employed, the controller shall take action to establish another appropriate type of separation or separation minimum. When an aircraft cannot meet the specifications as required by the RNAV route or procedure, as a result of a failure or degradation of the RNAV system, a revised clearance shall be requested by the pilot. The pilot shall inform ATC as soon as possible of any circumstances where the vertical navigation performance requirements for RVSM airspace cannot be maintained. In such cases, the pilot shall obtain a revised ATC clearance prior to initiating any deviation from the cleared route and/or flight level, whenever possible. When a revised ATC clearance cannot be obtained prior to such a deviation, the pilot shall obtain a revised clearance as soon as possible thereafter. in all read-backs of level clearances. Air traffic controllers shall explicitly acknowledge receipt of messages from aircraft reporting RVSM non-approved status. When informed by the pilot of an RVSM-approved aircraft operating in RVSM airspace that the aircraft's equipment no longer meets the RVSM requirements, ATC shall consider the aircraft as non-RVSM-approved. ATC shall take action immediately to provide a minimum vertical separation of 600 m (2 000 ft) or an appropriate horizontal separation from all other aircraft concerned that are operating in RVSM airspace. An aircraft rendered non-RVSM-approved shall normally be cleared out of RVSM airspace by ATC when it is possible to do so. Pilots shall inform ATC, as soon as practicable, of any restoration of the proper functioning of equipment required to meet the RVSM requirements. The first ACC to become aware of a change in an aircraft's RVSM status shall coordinate with adjacent ACCs, as appropriate. When an aircraft operating in RVSM airspace encounters severe turbulence due to weather or wake vortex that the pilot believes will impact the aircraft's capability to maintain its cleared flight level, the pilot shall inform ATC. ATC shall establish either an appropriate horizontal separation or an increased minimum vertical separation. ATC shall, to the extent possible, accommodate pilot requests for flight level and/or route changes and shall pass on traffic information, as required. ATC shall solicit reports from other aircraft to determine whether RVSM should be suspended entirely or within a specific flight level band and/or area. The ACC suspending RVSM shall coordinate with adjacent ACCs such suspension(s) and any required adjustments to sector capacities, as appropriate, to ensure an orderly progression of the transfer of traffic. When a meteorological forecast is predicting severe turbulence within RVSM airspace, ATC shall determine whether RVSM should be suspended and, if so, for how long and for which specific flight level(s) and/or area. ACAS II shall be used during flight, except as provided in the minimum equipment list specified in Commission Regulation (EU) No 965/2012 (****) in a mode that enables RA indications to be produced for the flight crew when undue proximity to another aircraft is detected. This shall not apply if inhibition of RA indication mode (using traffic advisory (TA) indication only or equivalent) is called for by an abnormal procedure or due to performance-limiting conditions. notify ATC when returning to the current clearance. When a pilot reports an ACAS RA, the controller shall not attempt to modify the aircraft flight path until the pilot reports “CLEAR OF CONFLICT”. the controller acknowledges a report from the flight crew that the aircraft is resuming the current clearance and issues an alternative clearance which is acknowledged by the flight crew. (****) Commission Regulation (EU) No 965/2012 of 5 October 2012 laying down technical requirements and administrative procedures related to air operations pursuant to Regulation (EC) No 216/2008 of the European Parliament and of the Council (OJ L 296, 25.10.2012, p. 1).’;"
Flight crews shall compile the reports using forms based on the model AIREP SPECIAL form as set out in point A of Appendix 5. Those reports shall comply with the detailed instructions for reporting, as provided in point 2 of Appendix 5. The detailed instructions, including the formats of messages and the phraseologies provided in Appendix 5, shall be used by flight crews when transmitting air-reports and by ATS units when retransmitting such reports. When an aircraft carries a serviceable SSR transponder, the pilot shall operate the transponder at all times during flight, regardless of whether the aircraft is within or outside airspace where SSR is used for ATS purposes. Pilots shall not operate the IDENT feature unless requested by ATS. Except for flight in airspace designated by the competent authority for mandatory operation of transponder, aircraft without sufficient electrical power supply are exempted from the requirement to operate the transponder at all times. attempt to select Code 7500 to indicate a state of unlawful interference. If circumstances so warrant, Code 7700 should be used instead. when not receiving air traffic services, select code 7000 in order to improve the detection of suitably equipped aircraft unless otherwise prescribed by the competent authority. if the discrepancy between assigned and displayed codes still persists, the pilot may be requested to stop the operation of the aircraft's transponder. The next control position and any other affected unit using SSR and/or multilateration (MLAT) in the provision of ATS shall be informed accordingly. When the aircraft carries serviceable Mode C equipment, the pilot shall continuously operate this mode unless otherwise dictated by ATC. Unless otherwise prescribed by the competent authority, verification of the pressure-altitude-derived level information displayed to the controller shall be effected at least once by each suitably equipped ATC unit on initial contact with the aircraft concerned or, if this is not feasible, as soon as possible thereafter. Aircraft equipped with Mode S having an aircraft identification feature shall transmit the aircraft identification as specified in Item 7 of the ICAO flight plan or, when no flight plan has been filed, the aircraft registration. Whenever it is observed on the situation display that the aircraft identification transmitted by a Mode S-equipped aircraft is different from that expected from the aircraft, the pilot shall be requested to confirm and, if necessary, re-enter the correct aircraft identification. notify the next control position and any other unit concerned using Mode S for identification purposes that the aircraft identification transmitted by the aircraft is erroneous. In case of a transponder failure after departure, ATC units shall attempt to provide for continuation of the flight to the destination aerodrome in accordance with the flight plan. Pilots may, however, be expected to comply with specific restrictions. comply with any published procedures for requesting an exemption from the requirements to carry a functioning SSR transponder. Standardised phraseology shall be used in all situations for which it has been specified. Only when standardised phraseology cannot serve an intended transmission, plain language shall be used. The categories of messages handled by the aeronautical mobile service, and the order of priority in the establishment of communications and the transmission of messages shall be in accordance with Table S14-1. Distress messages and distress traffic shall be handled in accordance with the provisions of point SERA.14095. Urgency messages and urgency traffic, including messages preceded by the medical transports signal, shall be handled in accordance with the provisions of point SERA.14095. other messages concerning aircraft in flight or about to depart. The air-ground radiotelephony communications shall be conducted in the English language or in the language normally used by the station on the ground. The English language shall be available, on request of any aircraft, at all stations on the ground serving designated aerodromes and routes used by international air services. Unless otherwise prescribed by the competent authority for specific cases, the English language shall be used for communications between the ATS unit and aircraft, at aerodromes with more than 50 000 international IFR movements per year. Member States, where at the date of entry into force of this Regulation, the English language is not the only language used for communications between the ATS unit and aircraft at such aerodromes, may decide not to apply the requirement to use the English language and inform the Commission accordingly. In that case, those Member States shall, by 31 December 2017 at the latest, conduct a study on the possibility to require the use of the English language for communications between the ATS unit and aircraft at those aerodromes for reasons of safety, so as to avoid incursions of aircraft on an occupied runway or other safety risks, while taking into account the applicable provisions of Union and national law on the use of languages. They shall make that study public and communicate its conclusions to the Agency and the Commission. The languages available at a given station on the ground shall form part of the Aeronautical Information Publications and other published aeronautical information concerning such facilities. When proper names, service abbreviations and words of which the spelling is doubtful are spelled out in radiotelephony, the alphabet in the Table S14-2 shall be used. In the approximate representation using the Latin alphabet, syllables to be emphasised are underlined. In voice communications, the basic letter of a designator shall be spoken in accordance with the spelling alphabet as defined in Table S14-2. The word “kopter” shall be pronounced as in the word “helicopter” and the words “upper” and “supersonic” as in the English language. Normally the plain language name for significant points marked by the site of a radio navigation aid, or the unique five-letter pronounceable “name-code” for significant points not marked by the site of a radio navigation aid, shall be used to refer to the significant point in voice communications. If the plain language name for the site of a radio navigation aid is not used, it shall be replaced by the coded designator which, in voice communications, shall be spoken in accordance with the spelling alphabet. The plain language designator for standard instrument departure or arrival routes shall be used in voice communications. All numbers used in the transmission of aircraft call sign, headings, runway, wind direction and speed shall be transmitted by pronouncing each digit separately. Flight levels shall be transmitted by pronouncing each digit separately, except for the case of flight levels in whole hundreds. The altimeter setting shall be transmitted by pronouncing each digit separately, except for the case of a setting of 1 000 hPa, which shall be transmitted as “ONE THOUSAND”. All numbers used in the transmission of transponder codes shall be transmitted by pronouncing each digit separately except that, when the transponder codes contain whole thousands only, the information shall be transmitted by pronouncing the digit in the number of thousands followed by the word “THOUSAND”. All numbers used in transmission of other information than those described in point (a)(1) shall be transmitted by pronouncing each digit separately, except that all numbers containing whole hundreds and whole thousands shall be transmitted by pronouncing each digit in the number of hundreds or thousands followed by the word “HUNDRED” or “THOUSAND”, as appropriate. Combinations of thousands and whole hundreds shall be transmitted by pronouncing each digit in the number of thousands followed by the word “THOUSAND”, followed by the number of hundreds followed by the word “HUNDRED”. In cases where there is a need to clarify the number transmitted as whole thousands and/or whole hundreds, the number shall be transmitted by pronouncing each digit separately. When providing information regarding the relative bearing to an object or to conflicting traffic in terms of the 12-hour clock, the information shall be given pronouncing the digits together such as “TEN O'CLOCK” or “ELEVEN O'CLOCK”. Numbers containing a decimal point shall be transmitted as prescribed in point (a)(1) with the decimal point in appropriate sequence, indicated by the word “DECIMAL”. All six digits of the numerical designator shall be used to identify the transmitting channel in very high frequency (VHF) radiotelephony communications, except in the case of both the fifth and sixth digits being zeros, in which case only the first four digits shall be used. Transmissions shall be conducted concisely in a normal conversational tone. “Continue in accordance with the condition(s) specified” or in its literal sense. “No” or“Permission not granted” or“That is not correct” or“Not capable”. (3) Type (c)— the telephony designator of the aircraft operator, followed by the flight identification. (3) Type (c)— no abbreviated form. An aircraft shall not change the type of its radiotelephony call sign during flight, except temporarily on the instruction of an ATC unit in the interests of safety. Except for reasons of safety, no transmission shall be directed to an aircraft during take-off, during the last part of the final approach or during the landing roll. Full radiotelephony call signs shall always be used when establishing communication. When establishing communication, aircraft shall start their call by the designation of the station called, followed by the designation of the station calling. The reply to the above calls shall use the call sign of the station calling, followed by the call sign of the station answering, which shall be considered an invitation to proceed with transmission by the station calling. For transfers of communication within one ATS unit, the call sign of the ATS unit may be omitted, when so authorised by the competent authority. Communications shall commence with a call and a reply when it is desired to establish contact, except that, when it is certain that the station called will receive the call, the calling station may transmit the message, without waiting for a reply from the station called. Abbreviated radiotelephony call signs, as prescribed in point SERA.14050(b), shall be used only after satisfactory communication has been established and provided that no confusion is likely to arise. An aircraft shall use its abbreviated call sign only after it has been addressed in this manner by the aeronautical station. When issuing ATC clearances and reading back such clearances, controllers and pilots shall always add the call sign of the aircraft to which the clearance applies. For other than those occasions, continuous two-way communication after contact has been established shall be permitted without further identification or call until termination of the contact. An aircraft shall be advised by the appropriate ATS unit to transfer from one radio frequency to another in accordance with agreed procedures. In the absence of such advice, the aircraft shall notify the ATS unit before such a transfer takes place. When establishing initial contact on, or when leaving, a VHF frequency, an aircraft shall transmit such information as may be prescribed by the ANSP responsible for the provision of services and approved by the competent authority. additional elements, as required by the ANSP responsible for the provision of services and approved by the competent authority. Pilots shall provide level information at the nearest full 30 m or 100 ft as indicated on the pilot's altimeter. information regarding the readability of the station requesting the test transmission. Communications shall be concise and unambiguous, using standard phraseology whenever available. When transmitted by an aircraft, the acknowledgement of receipt of a message shall comprise the call sign of that aircraft. When acknowledgement of receipt is transmitted by an ATS unit to an aircraft, it shall comprise the call sign of the aircraft, followed if considered necessary, by the call sign of the ATS unit. A radiotelephone conversation shall be terminated by the receiving ATS unit or the aircraft using its own call sign. When an error has been made in transmission, the word “CORRECTION” shall be spoken, the last correct group or phrase repeated, and then the correct version transmitted. If a correction can best be made by repeating the entire message, the phrase “CORRECTION, I SAY AGAIN” shall be used before the message is transmitted a second time. If the receiving station is in doubt as to the correctness of the message received, a repetition either in full or in part shall be requested. If repetition of an entire message is required, the words “SAY AGAIN” shall be spoken. If repetition of a portion of a message is required, the phrase: “SAY AGAIN ALL BEFORE… (first word satisfactorily received)” shall be used; or “SAY AGAIN… (word before missing portion) TO…(word after missing portion)”; or “SAY AGAIN ALL AFTER… (last word satisfactorily received)”. If, in checking the correctness of a read-back, incorrect items are noticed, the words “NEGATIVE I SAY AGAIN” shall be transmitted at the conclusion of the read-back followed by the correct version of the items concerned. During flight, aircraft shall maintain watch as required by the competent authority and shall not cease watch, except for reasons of safety, without informing the ATS unit concerned. Aircraft on long over-water flights or on flights over designated areas over which the carriage of an emergency locator transmitter (ELT) is required, shall continuously guard the VHF emergency frequency 121,5 MHz, except for those periods when aircraft carry out communications on other VHF channels or when airborne equipment limitations or cockpit duties do not permit simultaneous guarding of two channels. Aircraft shall continuously guard the VHF emergency frequency 121,5 MHz in areas or over routes where the possibility of interception of aircraft or other hazardous situations exists, and a requirement has been established by the competent authority. Aeronautical stations shall maintain a continuous listening watch on VHF emergency channel 121,5 MHz during the hours of service of the units at which it is installed. Where two or more such stations are co-located, provision of 121,5 MHz listening watch at one of them shall meet that requirement. When it is necessary for an aircraft or ATS unit to suspend operation for any reason, it shall, if possible, so inform other stations concerned, giving the time at which it is expected that operation will be resumed. When operation is resumed, other stations concerned shall be so informed. When it is necessary to suspend operation beyond the time specified in the original notice, a revised time of resumption of operation shall, if possible, be transmitted at or near the time first specified. When an aircraft fails to establish contact on the designated channel, on the previous channel used or on another channel appropriate to the route, and fails to establish communication with the appropriate ATS unit, other ATS unit or other aircraft using all available means, the aircraft shall transmit its message twice on the designated channel(s), preceded by the phrase “TRANSMITTING BLIND” and, if necessary, include the addressee(s) for which the message is intended. when provided with ATS, transmit information regarding the intention of the pilot-in-command with respect to the continuation of the flight. request aircraft on the route to attempt to establish communication with the aircraft and relay traffic, if necessary. when an expected communication from an aircraft has not been received within a time period such that the occurrence of a communication failure is suspected. Phraseologies for the movement of vehicles, other than tow-tractors, on the manoeuvring area shall be the same as those used for the movement of aircraft, with the exception of taxi instructions, in which case the word “PROCEED” shall be substituted for the word “TAXI” when communicating with vehicles. Air traffic advisory service does not deliver “clearances” but only “advisory information” and it shall use the word “advise” or “suggest” when a course of action is proposed to an aircraft. For aircraft in the heavy wake turbulence category, the word “Heavy” shall be included immediately after the aircraft call sign in the initial radiotelephony contact between such aircraft and ATS units. For specific aircraft in the heavy wake turbulence category, as identified by the competent authority, the word “Super” shall be included immediately after the aircraft call sign in the initial radiotelephony contact between such aircraft and ATS units. When the pilot initiates communications with ATC, a rapid response may be obtained by stating “WEATHER DEVIATION REQUIRED” to indicate that priority is desired on the frequency and for ATC response. When necessary, the pilot shall initiate communications using the urgency call “PAN PAN” (preferably spoken three times). (i) Distress : a condition of being threatened by serious and/or imminent danger and of requiring immediate assistance. (ii) Urgency : a condition concerning the safety of an aircraft or other vehicle, or of some person on board or within sight, but which does not require immediate assistance. The radiotelephony distress signal “MAYDAY” and the radiotelephony urgency signal “PAN PAN” shall be used at the commencement of the first distress and urgency communication respectively. At the commencement of any subsequent communication in distress and urgency traffic, it shall be permissible to use the radiotelephony distress and urgency signals. The originator of messages addressed to an aircraft in distress or urgency condition shall restrict to the minimum the number and volume and content of such messages as required by the condition. If no acknowledgement of the distress or urgency message is made by the ATS unit addressed by the aircraft, other ATS units shall render assistance as prescribed in points (b)(2) and (b)(3) respectively. Distress and urgency traffic shall normally be maintained on the frequency on which such traffic was initiated until it is considered that better assistance can be provided by transferring that traffic to another frequency. In cases of distress and urgency communications, in general, the transmissions by radiotelephony shall be made slowly and distinctly, each word being clearly pronounced to facilitate transcription. present position, level and heading. warn other ATS units, as appropriate, in order to prevent the transfer of traffic to the frequency of the distress communication. the radiotelephony distress signal “MAYDAY”. The use of the signals specified in point (b)(3)(i) shall be reserved for the aircraft in distress and for the ATS unit controlling the distress traffic. it has itself to render assistance. Any ATS unit/aircraft which has knowledge of distress traffic, and which cannot itself assist the aircraft in distress, shall nevertheless continue listening to such traffic until it is evident that assistance is being provided. When an aircraft is no longer in distress, it shall transmit a message cancelling the distress condition. the aircraft operator concerned, or its representative, in accordance with pre-established arrangements. The distress communication and silence conditions shall be terminated by transmitting a message, including the words “DISTRESS TRAFFIC ENDED”, on the frequency or frequencies being used for the distress traffic. This message shall be originated only by the ATS unit controlling the communications when, after the reception of the message prescribed in point (b)(5)(i), it is authorised to do so by the competent authority. if necessary, exercise control of communications. The urgency communications have priority over all other communications except distress communications and all ATS units/aircraft shall take care not to interfere with the transmission of urgency traffic. The use of the signal described in point (c)(4)(ii) shall indicate that the message which follows concerns a protected medical transport pursuant to the 1949 Geneva Conventions and Additional Protocols. For the purpose of announcing and identifying aircraft used for medical transports, a transmission of the radiotelephony urgency signal “PAN PAN”, preferably spoken three times, and each word of the group pronounced as the French word “panne”, shall be followed by the radiotelephony signal for medical transports “MAY-DEE-CAL”, pronounced as in the French “medical”. The use of the signals described above indicates that the message which follows concerns a protected medical transport. any other information such as flight altitude, radio frequencies guarded, languages used and secondary surveillance radar modes and codes. Brakes engaged: raise arm and hand, with fingers extended, horizontally in front of face, then clench fist. Brakes released: raise arm, with fist clenched, horizontally in front of face, then extend fingers. Insert chocks: arms extended, palms outwards, move hands inwards to cross in front of face. Remove chocks: hands crossed in front of face, palms outwards, move arms outwards. 1.1.1. 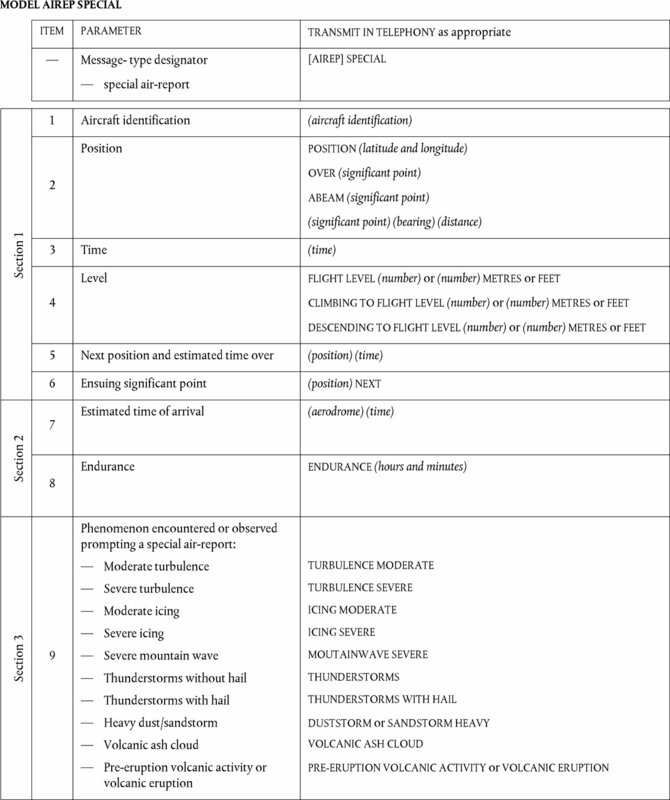 Section 1 of the model set out in point A is obligatory for position reports and special air-reports, although Items 5 and 6 thereof may be omitted. Section 2 shall be added, in whole or in part, only when so requested by the operator or its designated representative, or when deemed necessary by the pilot-in-command. Section 3 shall be included in special air-reports. 1.1.2. Condition prompting the issuance of a special air-report are to be selected from the list presented in point SERA.12005(a). 1.1.3. In the case of special air-reports containing information on volcanic activity, a post-flight report shall be made using the volcanic activity reporting form (Model VAR) set out in point B. All elements which are observed shall be recorded and indicated respectively in the appropriate places on the form Model VAR. 1.1.4. Special air-reports shall be issued as soon as practicable after a phenomenon calling for a special air-report has been observed. 2.1. Items of an air-report shall be reported in the order in which they are listed in the model AIREP SPECIAL form. MESSAGE TYPE DESIGNATOR. Report “SPECIAL” for a special air-report. Item 1 — AIRCRAFT IDENTIFICATION. Report the aircraft radiotelephony call sign as prescribed in point SERA.14050. Item 2 — POSITION. Report position in latitude (degrees as 2 numerics or degrees and minutes as 4 numerics, followed by “North” or “South”) and longitude (degrees as 3 numerics or degrees and minutes as 5 numerics followed by “East” or “West”), or as a significant point identified by a coded designator (2 to 5 characters), or as a significant point followed by magnetic bearing (3 numerics) and distance in nautical miles from the point. Precede significant point with “ABEAM”, if applicable. Item 3 — TIME. Report time in hours and minutes UTC (4 numerics) unless reporting time in minutes past the hour (2 numerics) is prescribed on the basis of regional air navigation agreements. The time reported must be the actual time of the aircraft at the position and not the time of origination or transmission of the report. Time shall always be reported in hours and minutes UTC when issuing a special air-report. Item 4 — FLIGHT LEVEL OR ALTITUDE. Report flight level by 3 numerics when on standard pressure altimeter setting. Report altitude in metres followed by “METRES” or in feet followed by “FEET” when on QNH. Report “CLIMBING” (followed by the level) when climbing or “DESCENDING” (followed by the level) when descending to a new level after passing the significant point. Item 5 — NEXT POSITION AND ESTIMATED TIME OVER. Report the next reporting point and the estimated time over such reporting point, or report the estimated position that will be reached one hour later, according to the position reporting procedures in force. Use the data conventions specified in Item 2 for position. Report the estimated time over this position. Report time in hours and minutes UTC (4 numerics) unless reporting time in minutes past the hour (2 numerics) as prescribed by regional air navigation agreements. Item 6 — ENSUING SIGNIFICANT POINT. Report the ensuing significant point following the ‘next position and estimated time over’. Item 7 — ESTIMATED TIME OF ARRIVAL. Report the name of the aerodrome of the first intended landing, followed by the estimated time of arrival at this aerodrome in hours and minutes UTC (4 numerics). Item 8 — ENDURANCE. Report “ENDURANCE” followed by fuel endurance in hours and minutes (4 numerics). severe turbulence as “TURBULENCE SEVERE”. — Moderate— Conditions in which moderate changes in aircraft attitude and/or altitude may occur but the aircraft remains in positive control at all times. Usually, small variations in airspeed. Changes in accelerometer readings of 0,5 g to 1,0 g at the aircraft's centre of gravity. Difficulty in walking. Occupants feel strain against seat belts. Loose objects move about. — Severe— Conditions in which abrupt changes in aircraft attitude and/or altitude occur; aircraft may be out of control for short periods. Usually, large variations in airspeed. Changes in accelerometer readings greater than 1,0 g at the aircraft's centre of gravity. Occupants are forced violently against seat belts. Loose objects are tossed about. — Moderate— Conditions in which change of heading and/or altitude may be considered desirable. — Severe— Conditions in which immediate change of heading and/or altitude is considered essential. — Severe— Conditions in which the accompanying downdraft is 3,0 m/s (600 ft/min) or more and/or severe turbulence is encountered. “Pre-eruption volcanic activity” in this context means unusual and/or increasing volcanic activity which could presage a volcanic eruption. 2.2. Information recorded on the volcanic activity reporting form (Model VAR) is not for transmission by RTF but, on arrival at an aerodrome, is to be delivered without delay by the operator or a flight crew member to the aerodrome meteorological office. If such an office is not easily accessible, the completed form shall be delivered in accordance with local arrangements agreed upon between MET and ATS providers and the aircraft operator. When receiving special air-reports, ATS units shall forward these air-reports without delay to the associated meteorological watch office (MWO). In order to ensure assimilation of air-reports in ground-based automated systems, the elements of such reports shall be transmitted using the data conventions specified below and in the order prescribed. ADDRESSEE. Record the station called and, when necessary, relay required. MESSAGE TYPE DESIGNATOR. Record “ARS” for a special air-report. AIRCRAFT IDENTIFICATION. Record the aircraft identification using the data convention specified for Item 7 of the flight plan, without a space between the operator's designator and the aircraft registration or flight identification, if used. Item 0 — POSITION. Record position in latitude (degrees as 2 numerics or degrees and minutes as 4 numerics, followed, without a space, by N or S) and longitude (degrees as 3 numerics or degrees and minutes as 5 numerics, followed without a space by E or W), or as a significant point identified by a coded designator (2 to 5 characters), or as a significant point followed by magnetic bearing (3 numerics) and distance in nautical miles (3 numerics) from the point. Precede significant point with “ABEAM”, if applicable. Item 1 — TIME. Record time in hours and minutes UTC (4 numerics). Item 2 — FLIGHT LEVEL OR ALTITUDE. Record ‘F’ followed by 3 numerics (e.g. “F310”) when a flight level is reported. Record altitude in metres followed by “M” or in feet followed by “FT” when an altitude is reported. Record “ASC” (level) when climbing or “DES” (level) when descending. TIME TRANSMITTED. Record only when Section 3 is transmitted. 4.1.1. When reporting aircraft observations of wind shear encountered during the climb-out and approach phases of flight, the aircraft type shall be included. 4.1.2. Where wind shear conditions in the climb-out or approach phases of flight were reported or forecast but not encountered, the pilot-in-command shall advise the appropriate ATS unit as soon as practicable unless the pilot-in-command is aware that the appropriate ATS unit has already been so advised by a preceding aircraft. 4.2.1. On arrival of a flight at an aerodrome, the completed report of volcanic activity shall be delivered by the aircraft operator or a flight crew member, without delay, to the aerodrome meteorological office, or if such office is not easily accessible to arriving flight crew members, the completed form shall be dealt with in accordance with local arrangements agreed upon between MET and ATS providers and the aircraft operator. 4.2.2. The completed report of volcanic activity received by an aerodrome meteorological office shall be transmitted without delay to the meteorological watch office responsible for the provision of meteorological watch for the flight information region in which the volcanic activity was observed. Air- reports are critically important in assessing the hazards which volcanic ash cloud presents to aircraft operations. Items 1-8 are to be reported immediately to the ATS unit that you are in contact with. Differences between this Regulation and the International Standards contained in Annex 3 to the Convention on International Civil Aviation, as amended. Competent authorities shall prescribe as necessary other conditions which shall be reported by all aircraft when encountered or observed. Differences between this Regulation and the International Standards contained in Annex 10 to the Convention on International Civil Aviation, as amended. Flight levels shall be transmitted by pronouncing each digit separately except for the case of flight levels in whole hundreds. The altimeter setting shall be transmitted by pronouncing each digit separately except for the case of a setting of 1 000 hPa which shall be transmitted as “ONE THOUSAND”. All numbers used in transmission of other information than those described in point (a)(1) shall be transmitted by pronouncing each digit separately, except that all numbers containing whole hundreds and whole thousands shall be transmitted by pronouncing each digit in the number of hundreds or thousands followed by the word “HUNDRED” or “THOUSAND”, as appropriate. Combinations of thousands and whole hundreds shall be transmitted by pronouncing each digit in the number of thousands followed by the word “THOUSAND”, followed by the number of hundreds, followed by the word “HUNDRED”. When providing information regarding relative bearing to an object or to conflicting traffic in terms of the 12-hour clock, the information shall be given pronouncing the digits together such as “TEN O'CLOCK” or “ELEVEN O'CLOCK”. Numbers containing a decimal point shall be transmitted as prescribed in point (a)(1) with the decimal point in appropriate sequence indicated by the word “DECIMAL”. All six digits of the numerical designator shall be used to identify the transmitting channel in Very High Frequency (VHF) radiotelephony communications except in the case of both the fifth and sixth digits being zeros, in which case only the first four digits shall be used.